I was pretty excited about this race for a week. The reasons for that fluctuated throughout the week. I have been stepping up the time on feet activity and changing the way I look at running a little. Everyone I talked to this week seemed to be focused on getting people active. They didn’t have to complete a marathon, but had to do something. I talked to people that a year ago thought running a 10k was crazy and this weekend they completed their first half marathon. One of the reasons was to try out a new pre race dinner. This included salmon, wild rice, and potatoes. Of course, due to my packed schedule, I had about 45 minutes on Saturday to prepare and eat before running off to the next activity. It was really simple to make which is always nice. 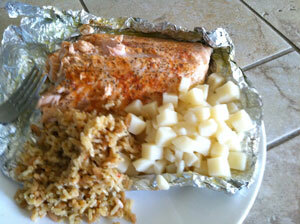 I made a little bowl out of tinfoil for the salmon to cook in. In a bowl I mixed together 4tsp of olive oil and 4tbs of lemon juice, poured it over the salmon. Then I sprinkled pepper and paprika on top and covered with another sheet of tinfoil. Popped that into the oven for about 20 minutes at 375 degrees. Easy stuff! I knew there was a chance of a PR, but every race has their own plan for you. See Greenland 50k DNF thank you very much. Then I reminded myself this was all training for the Leadville 100. It was all part of my mission to complete 100 miles in one day on foot while raising $10,000 for the American Cancer Society. As long as I learned something during the race, then it was a success. 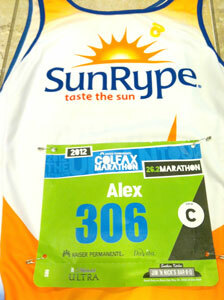 Ultimately my excitement for this race, one that I have run 4 times, came down to the running community. 95% of my running and training I do alone. I choose to do it that way because I don’t want to burden anyone with my inconsistently extreme training. Take this marathon for instance. I took 4 months off from running, started running again 6 weeks ago, and here I am running a marathon. Many would say that’s not normal. Eh … that’s why there are probably 100,000 books, videos, and programs on exercise. Everyone is different. It was great to get outside and run on the road with a few thousand friends. People supporting one another, strangers on the side of the road cheering your name (name was on bib), and those that took an action for a change. So often people sitting around talking about how out of shape they are, that the government is doing it wrong, or they just can’t get that promotion. People that complete marathons are do-ers. No excuses. Go out and get it done. They have a different mentality when approaching challenges. I have always said that given two equal candidates for a job, I’ll take the one that runs. Different mindset. 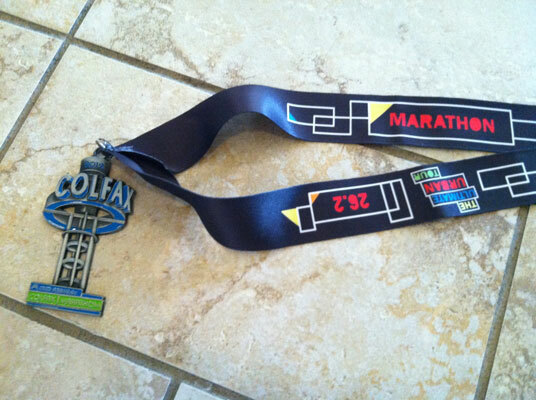 Getting into corrals was a piece of cake compared to other marathons. I was happy to find out that the Star Spangled Banner was to be sung by Jake Schroeder. He’s the lead singer of Opie Gone Bad and the official National Anthem singer for the Colorado Avalanche. I really like his take on the song and voice. Great way to start! In my corral I lined up next to the 4:15 pacer. As we crossed the starting line, I noticed I was the only one running along with her. We struck up a conversation and I learned that she was doing her first ultra (50 miles) next month. She talked about her training, what to eat, her goals, and challenges. It was great to hear the stories of the college days and how training changes when other priorities arrive on life’s journey. At mile 4 I moved on ahead feeling pretty good about my pace. I was pushing low 9 minute pace and still feeling good. I rounded the corner and passed through the fire station. That was pretty cool! It went by in about 6 seconds, but still a pretty cool addition. After exiting the fire station, crossed the street and down to the Platte River path. This was nice because up ahead I could start seeing Elitch Gardens in sight which meant that Mile High Field where the Broncos play was around the corner. A month ago when I heard the course was going inside the stadium, that added to my excitement of this race. 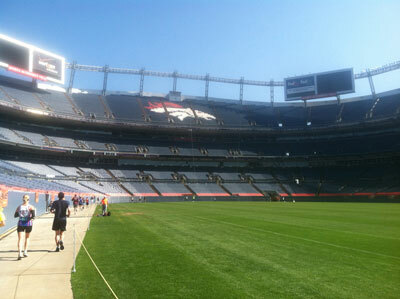 The stadium was fun running into the tunnel and out at field level. Very cool to look up at all the seats surrounding the field and imagine how the players feel every game being at the center of it all. “Eat this Oreo cookie so you run faster!” Words of wisdom from my 7 year old daughter the night before. How could I disagree with her logic? Around Mile 8 I thought about that conversation when I was starting to drag. Seemed like good time as it was time to circle Sloan’s Lake. I generally don’t do well running around lakes, no idea why, but this one I was feeling pretty good. Cruised through those 3 miles looking at the birds, people, and cars on the perimeter. I hit the halfway point at 2:08 which felt good. No stopping and still smiling. The sun was high above with no cloud cover so I continued to drink. I spent the next 3 miles looking for open bathrooms which can make getting to the next aid station speed up, yet a little painful. About 16 is when the bonk hit. I knew it was going to be coming and was mentally prepared for it. I initiated my run/walk strategy to see if that would battle it. Looked at my watch and told myself you have 4 minutes to walk and get yourself together. Then I was off. My running was about 9 minute pace and walking close to 14 minute pace. Averages out to not a bad pace. Coming up on Mile 22 I was mentally gone. Nothing really hurt, but the message from my brain was “sorry, we’re not here at the moment as we’ve gone out for coffee … check back later.” Damn. I knew this moment would pass as it always does, so decided to look around. He had a pacer in front of him that had a rope attached to him he was holding onto. There was also a radio on the pacer’s back. I imagine it helped the blind man know if he was inline with the pacer as well as provide some entertainment. It was amazing to see how they worked together to move forward. The pacer would call out if there was a change in surface conditions, then countdown 3-2-1-0 to let him know when his feet would be impacted. I toted along with these guys for about 2 miles just watching and listening. It was an awesome inspiration that showed anything can be done by those that want to. This blind guy was completing a marathon … no excuses. At mile 24 some race planner thought it would be cute to stick in a big hill. I knew it was there as I had been on 17th Street and many races take this route. It was time to become the “Hill Crusher” and just power through the hill. I could always rest at the top … yet my brain knows I’ve played that trick a few times. Even though, I powered on up possibly yelling out Hill Crusher! a few times. You get to a point where you don’t care if people are watching. After the top of the hill was 2 miles to go. Now, many spectators like to toss the word “only” in there. Yeah, that doesn’t quite work. As I rolled down the hill and into City Park, I could start to hear the sounds from the Denver Zoo. That was enough for me to pick the feet and go! The finish line was great and welcomed it with arms in the air. 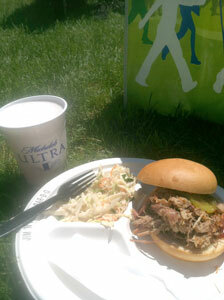 I won’t lie, for the last 2 miles all I could think about was the BBQ and beer waiting for me. Making my way from the finish line across the field was like being on a mission. There was nothing standing in between me and that food. It was quick to get the food, but as usual, challenging to get the beer. Races need to get the beer sponsor to spread out the beer tent to more then just two 8 foot tables. Crowds of tired people standing in the sun wanting a beer can turn bad fast. As I was about 2 people from the front, I noticed the delay seemed to be that the beer was coming out foamy. That generally means beer is almost out. I don’t want to be around when that happens. 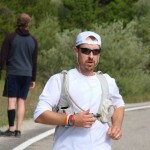 All-in-all it was a great training run for Leadville. Excellent time on the feet for conditioning the body to pounding and trying out new nutrition plans. The medal was pretty slick as well with it not being a standard circle. Nice when the races give medals specific to the distance and not just change the color of the string. 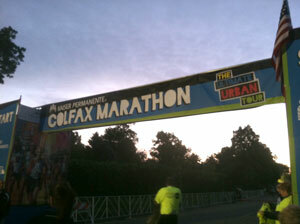 The Colfax Marathon continues to get better, listen, and learn with each year. We should all take note. Congrats on a great race! Seemed like the perfect day for nearly everyone I knew, there were a ton of PRs. Blind athletes always amaze me. There were several on the course during my Ironman, and I was just so inspired by the courage and determination they had. Way to go on your mary!! 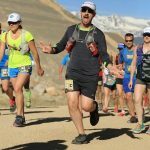 Hadn’t heard of blind runners/guides until someone we follow on twitter was a guide sometime this past year! So neat that you got to hang around them for a couple of miles and couldn’t even fathom the experience of being their guide! 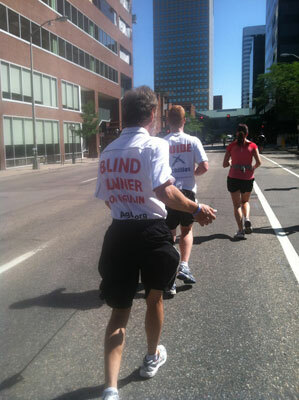 What an accomplishment to run a full marathon when you are blind! 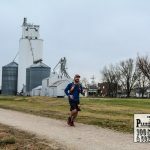 Being a new runner (11 weeks into my 50 week training for a full with two halfs scheduled before) it’s great to read others stories on running and why I created a blog and are following yours and others. Congrats on finishing. What group are you in for the Bolder Boulder? I am running with the EGs though I just ran a DD qualifying time this past weekend and being a lifer have always wanted to do this race so I am stoked. Good luck in your quest and a great cause being my Grandma was a 33 year survivor of breast cancer.